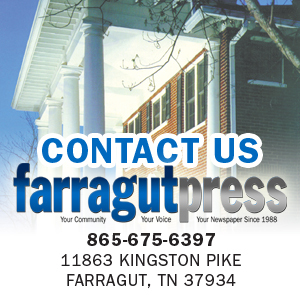 Farragut High School’s girls basketball team cruised to a Senior Night victory Saturday. And after the win, the school honored Morgan Carbaugh, Brooke Christian, Sydney Chapman and team manager Olivia Campbell, who dressed and started against Fulton (13-12) in FHS’s Lynn E. Sexton Gymnasium Feb. 2. On paper the result was a 72-31 win, but it seemed like much more, as the players in this senior class have endured some ups and downs during their four-year careers. Their freshmen season saw the Lady Ads win 20 games, but they failed to reach the Region 2-AAA Tournament. As sophomores and juniors, they were part of two teams that struggled and also failed to advance into region play. This season, however, things have been different as Farragut, 23-5 overall and 11-3 in District 4-AAA (third place) entering the week, are battling for a top two seed and a first-round bye in the upcoming district tournament. Freshman Avery “Ace” Strickland scored 13 points. Macy Barnes, a sophomore, added 10, while Claire Wyatt had nine. Madison Hodge scored seven points, followed by Christian with six. Chapman added five points while freshman Keeleigh Rogers finished with four. “I want to see what they do for the rest of the season,” Mayfield said. The Lady Ads had a pair of district games remaining in the regular season: at Heritage Tuesday night, Feb. 5 (results were unavailable at deadline). On Friday, Feb. 8, Farragut hosts rival Bearden in their regular-season finale. The Lady Ads entered the week still having a chance to finish second in the district by going 2-0 this week.